Last time we visited Chinatown in Toronto, my family and I noticed that a new restaurant had opened serving ramen noodles. Our attention was brought to this new establishment by the welcoming statue at the door. 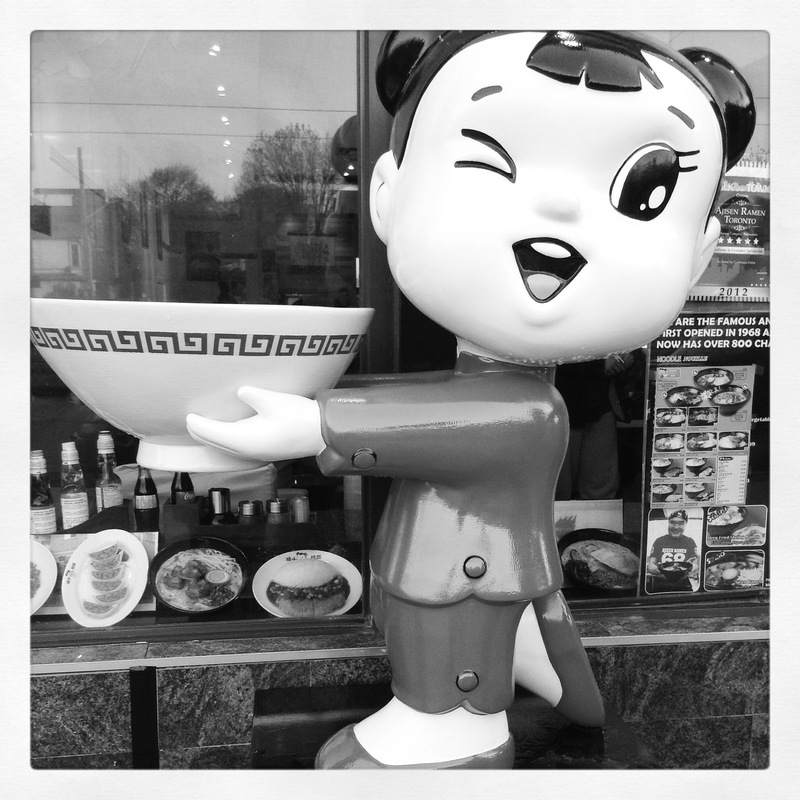 My girls love the statue and maybe the next time we are in the area, we will go have a taste of some Japanese noodles. Do you enjoy eating ramen noodles? I have never had them, but if your girls like them, they must be good :D. Thank you, Colline. This picture looks quite inviting! What a cute statue..that would have prompted me in as well!! There’s a company here in the States that makes pre-packaged ramen noodle soups. They say that the ramen noodles are actually Chinese-style wheat noodles, so maybe they won’t be any different from what your girls are used to. I love them. And I’d definitely visit that restaurant just to see that darling statue. The artist of this piece caught her spirit in every part of her face and demeanor. Great work there. I agree, that is why we loved the statue. And if the noodles are like the Chinese noodles I give my girls, they will eat these with enthusiasm. Vietnamese. So yummy! Give it a go! I love it too Jo. Adds to the atmosphere of the surroundings. Since I am housing a student from Hong Kong we eat lots of different noodles. Some are better than others. Interesting to learn to know them. Love your B&W photo. It is very clear and bright. Look at the reflection in the window also! Thank you Scrapy. The reflection was unintentional and I did not notice it until you brought it up. Shows you – makes the picture more interesting doesn’t it? Have never heard of them Colline but will google info and see what they are all about. That statue looks like a Japanese version of Betty Boop. You are right Ian! And they are both such fun-looking characters. Pingback: A Word A Week Photo Challenge: Kitsch | 2014 My Year!